A few news items from New York wine country this week. The “Hudson Valley Wine Country Summer Passport Ticket." 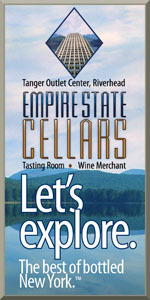 offers holders free complimentary wine tasting at 14 Hudson Valley Wineries between June 1 and August 31, 2010. The cost is $30 per ticket. The wineries participating are: Adair Vineyards, Applewood Winery, Baldwin Vineyards, Benmarl Winery, Brimstone Hill Vineyards, Brotherhood Winery, Clinton Vineyards, Glorie Farm Winery, Hudson-Chatham Winery, Millbrook Winery, Palaia Vineyards, Stoutridge Vineyard, Warwick Valley Winery & Distillery and Whitecliff Vineyard & Winery. 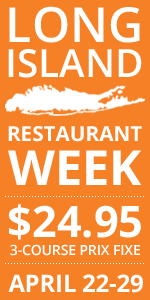 Tickets can be purchased from the Hudson Valley Wine Country website until May 31. Martha Clara Vineyards has a new assistant winemaker -- Robin Epperson. Epperson grew up on the North Fork, graduating from Mattituck high school in 1999. She moved to Virginia for college, receiving a bachelors degree in biology, with an eye towards medical school. She returned home to study for her MCATs, getting a temporary job at Premium Wine Group during harvest that turned into six years there, most recently as the lab director. She starts at Martha Clara on Monday and will be helping winemaker Juan Micieli-Martinez in the cellar because he's taken on the role as director of operations for the winery in addition to his winemaking duties. "I will be overseeing the overall direction of the vineyard in conjunction with the Entenmanns and the general manager. Robin will oversee the day-to-day stuff at Premium that I have been pulled away from," said Micieli-Martinez. As you may have read in Newsday this week, Shinn Estate Vineyards, well known for their sustainable vineyard practices, has begun the three-year process to become certified organic. No small feat in a cool, humid region, the certification would be the first on the East End. If successul, Shinn will be able to add "Made with Organic Grapes" to their wine labels. The wines themselves won't labeled organic because of the addition of sulfites at bottling.